It is pointless arguing about the size of a mythological poverty yardstick, since such a yardstick is bound to shift and any definition now is bound to betray ones own attitudes and opinions regarding class, status and position within society in general. Therefore a rebuttal of Archer’s central argument must take the form of a polite deferral, out of principle rather than numbers, statistics and percentages. One of the many undesirables, alluded to then, is that of indigence. 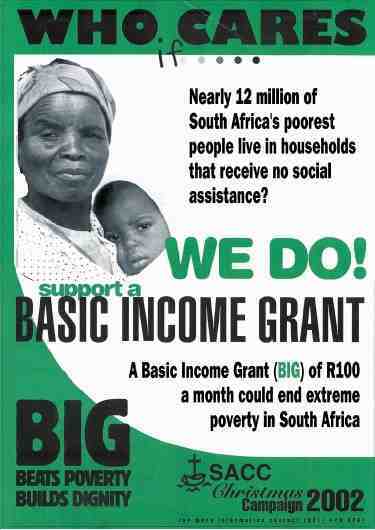 Would a Basic Income Grant eliminate indigence, at least in part, now or in the future? Depending upon its frequency and size it would in all likelihood alleviate some of the harshest forms of want in their various manifestations (begging, crime, prostitution) by giving those without any income something with which to trade and exchange for food, clothing and even shelter. It is pointless playing mind games that trick one into avoiding such conclusions. In theory South African citizenship should not be seen as a devout and pious honour, but rather a common right conferred upon all those who have the good fortune to enjoy it. It is emperitive rather to give full access to the various phrases of equality in the constitution, so all citizens may enjoy access to a basic welfare grant. Whether this be in exchange for work, or other skills and services, is up to the electorate to decide. However, Archer does himself and his liberal allies a disservice by claiming that BIG “will not necessarily advance the goals listed in the Bill of Rights”. He blankly asserts that “every SA citizen should achieve autonomy in the political, social and economic dimension of their lives.” Forgetting that there are few examples of complete autonomy, and the majority of our citizens are forced to rely upon the state for services. The autonomy issue is really the old liberal dependency issue in disguise, since what Archer is raising here is the problem of reliance upon a Welfare State, without examining citizenship and the degree to which the state is indebted to its citizenry for its very being. A debate about BIG has therefore very little to do with poverty per se and is rather all about the way one conceptualises statehood and citizenship. For citizenship to have any meaning, there must be equality, and for equality to make any sense, there must be some way of narrowing the gap between the rich and the poor. Taxation accomplishes this in part, but without a means of redistributing wealth, the incentives to enlarge government without accommodating the poor, become too numerous and engaging. (As the recent oilgate and arms deal saga no doubt prove.) As a result, the state is a burden on both wealthy and poor citizens alike who are essentially forced to sacrifice their lot, merely in order for the state to exist. One must argue therefore, in deferral, that the only reason one is ever in need of a state, is precisely so that equality and human rights may be given meaning. All that is required then is the political will needed to redistribute wealth via a programme of welfare equality without which South African citizenship is meaningless. Was kind of hoping somebody would disagree with me! When the European project goes on with a single currency we believe there will be an increasing need to develop new mechanisms for distributing wealth between nations and to regions and individuals. We believe, in short, that it is necessary to introduce some form of a partial basic income if the absolute poverty – and its associated problems – is to be eradicated. This reform could be financed from the European budget, from national budgets, from a so-called Tobin Tax, from a battery of eco-taxes throughout Europe and from reduced bureaucracy. The funding may also come from other sources. The point is not that we want to have basic income instead of a politics of full employment, but that we think that a partial basic income is what would best serve the less fortunate citizens of our societies. The point is also that we think that the need for some form of basic income will become the more obvious as the integration goes on. That is, if we think it is important to eradicate the absolute poverty. Last but not least we think it is necessary to fill the European citizenship with something real if it is going to mean anything at all for the ordinary citizen. So long as we don’t have a real economic content in the European citizenship we do not think that the necessary support for a further integration can be taken for granted. We therefore demand from our politicians, especially those who believe in a further integration and a common currency, to take this demand serious.